Why do seam rippers have cylindrical handles? Thread: Why do seam rippers have cylindrical handles? I am so tired of mine rolling off to parts unknown (usually under the extension table). It has not got a nice wood turned handle, you understand- it is just injection moulded plastic. Would it not be just as easy to make it a shape to fit the hand and not roll?!!!! Wrap a rubber band around the handle several times. Harder for it to roll away and gives you "something" to hold on better with. 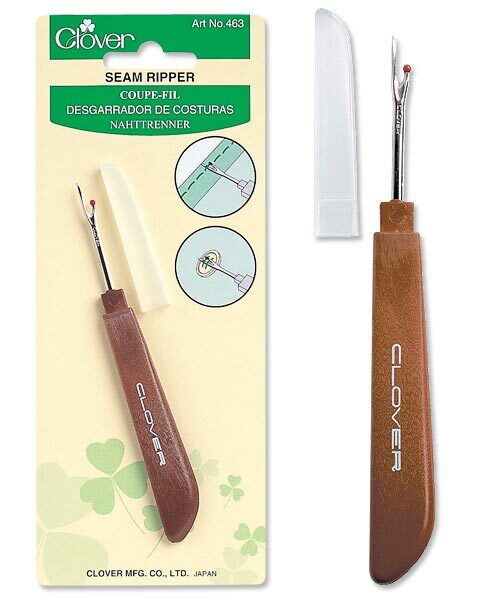 Be nice to yourself and get the Clover seam cutter. The shape of the handle prevents if from rolling, it fits nice in the hand, has a wonderful sharp sharp point. Clover makes both a white round handled one, a flat while one (Premier) and a brown flat handled one with a plastic point cover. All have that fabulous narrow point and very sharp blade. LOVE 'em! I buy the brown flat ones for less than $4 usually and keep 4-5 on hand. I love those brown-handled Clover seam rippers too, also the white round-handled ones. I tried the two-tone purple Dritz rippers (tried 2 or 3 of them) and the tips broke almost immediately. I don't know if it was just a bad batch or if the points are too narrow for the metal they're made of, but I don't intend to try them again. I have never seen that Clover ripper with the brown handle!!! I have several of the blue plastic flat handled ones though. Cheap and easily replaced. However, I am now on a quest to find that Clover ripper!!!! I replace seam rippers often. If I have to tug on a thread for it to cut then it's no good to me anymore. I like the Clover round white handle one. It just looks a little more elegant to me. Thanks Jan! I am going to get some like those. I to am getting tired of chasing mine! I have the brown one shown above, as well as the Clover one with the white round end. Both are equally as good for sharpness and fine point. However, I like the feel of the round white one in my hand, much better than the flat brown. Get in the habit of putting the round ones in the same place all the time ... where you know it cannot take off on you! I wish they'd make them more ergonomic with a larger handle, also. I have several, but my favorite is Alex Anderson's 4-in-1 tool. It has a large, easy-to-grip handle, a stiletto, a point turner, and a presser. :::::::grannie trucking off to the store tomorrow:::::::::::::: or the next day! I like the sound of this too- I use my rolling ripper as a stilletto and it does not make the job any easier. This is ergonomic, flat, very thin and sharp and pink - my favourite by far. Speaking of! I won a seam ripper made by Snap On tools, you know, the mechanics tools people. The tip was so fat I couldn't get it under the thread. Cute idea, not usable. I use the clover white handle and love it. The metal part came loose but a dab of hot glue fixed it. Happily unsewing in Alaska. Buried Under My Stash up in Canada! I also have the Alex Anderson 4 in 1 and love it! It is large enough you won't loose it. I have put my other rippers in a jar on the shelf and havent touched them since buying my 4 in 1. Quilt outside of the box!